Isn’t it great that the holiday season will soon be upon us? Many feel that way because it’s the season that’s all about giving. In a way, it’ll unofficially get going this Thursday with Halloween. The night when people generously give out free candy to youngsters brings to light something very special about our society. We actually experience gratification in seeing others happy. If the feeling to do a little bit of giving is in your future, you may want to consider offering a loved one the give gift Laser Tattoo Removal. If you’re anything like my friend Sara’s mother, you’d be only too eager to help someone you love remove a tattoo that they hate. It’s not uncommon for people to want to remove their tattoos. That’s because what they once thought was great, has somehow become gruesome! People change their minds about their tattoos all the time. In many cases, this is because the reason for getting the tattoo originally was based on the fact that it was a gift. As mentioned, giving is great. And making others happy is something that we should all aspire to do regularly. But if you’ve received a tattoo as a gift at a previous point in your life and you’re now regretting it, it doesn’t mean you have to live with it forever. Laser Tattoo Removal, you may find, may be the best gift you can either get or give someone you love. It is becoming increasingly popular as a gift considering how many people are no longer interested in the tattoos that they received at earlier stages in their lives. One such individual, also named Sara, appeared on “The Doctors” to demonstrate the ease of getting an “ugly tattoo” removed. 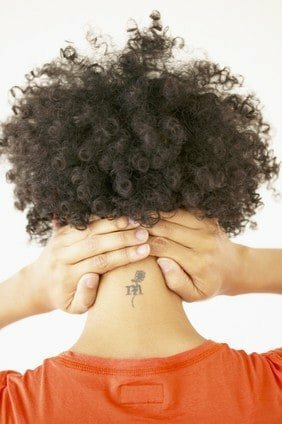 Dr. Will Kirby explains that Sara is actually a great candidate for give gift Laser Tattoo Removal because her neck tattoo is located in the “upper extremities” of her body. The neck, being “very vascular”, in addition to Sara having a fair complexion, makes it a lot easier for the laser to penetrate the ink particles for complete removal, says Dr. Kirby. In addition, black ink is the easiest to remove. He goes on to note that although Sara’s tattoo may require approximately ten sessions for complete removal, the amount of time spent removing it will pale in comparison to how long it took for her to get the tattoo. Commenting that her tattoo likely took “north of an hour” to complete by the tattoo artist, the cumulative amount of time under the laser for removal will end up being just a few minutes. 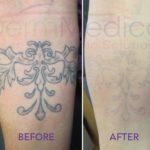 The video clip from “The Doctors”, which can be found on YouTube, also helps to showcase how relatively painless a Laser Tattoo Removal treatment is. While both physicians who are present continually check on Sara to discover if she is feeling any discomfort, it is clear that she is doing just fine. The entire process, as is demonstrated, is a quick and painless way to do away with a regrettable decision of years past. The Q-Switched Nd:YAG laser used by Dr. Kirby is the same technology as the one used by Dr. Crippen at DermMedica. We have more lasers for tattoo removal than anyone else in the Okanagan Valley and the Interior of BC. This holiday season, give yourself or someone you love the give gift Laser Tattoo Removal. It’s a quick, easy and painless way to experience the new year as a new you! 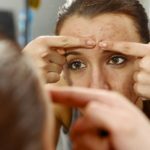 Call DermMedica toll free at 1-866-861-3070, or if you are in Kelowna, call 250-868-3070.